To conclude these last few posts with the original Bionicles I will. I waited till the last second to buy the green guy before he disappeared off store shelves. For some reason I don't like green things. I like blue things. But I don't like green things. Probalby because I like blue things more. But not green things. So to sum up, Green things good. Blue things bad. no wait. Blue things are good, green things are better. no wait. Blue things are good, green things are dumb. 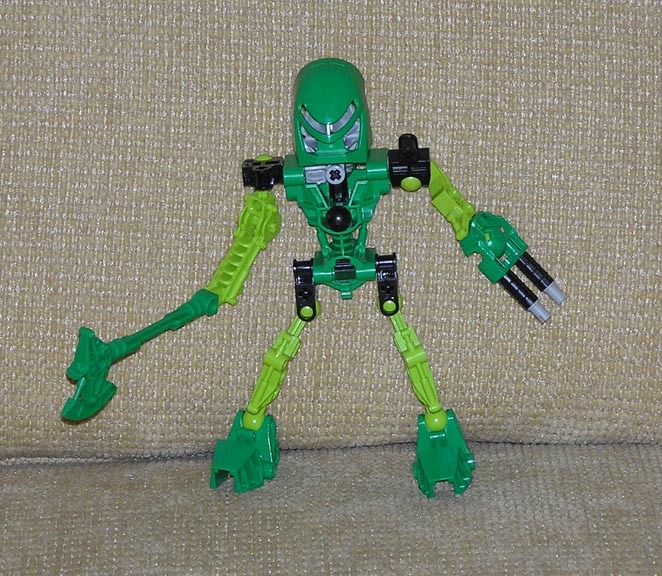 Anyhow, surprise to me, the green Bionicle is quite fun. He has this axe that can really pack a swing. 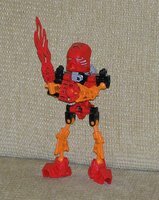 More than any other Bionicle's swing. 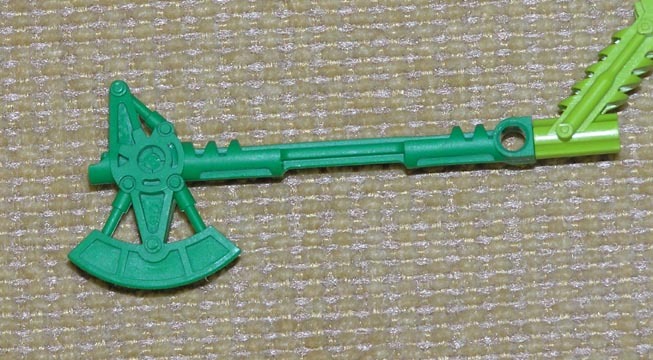 Must be a weight thing of the heavy blade part on a stick. When I get bored, I use him to chop pencils in half. Hooks for Hands can be a good thing! There are lots of things one can do with hooks for hands. Gali here can ask many a question with a mark above her head. Ever wonder who the Smurffette of the Bionicles is? 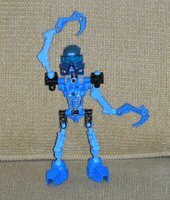 Look no furthur than the Blue water Bionicle. 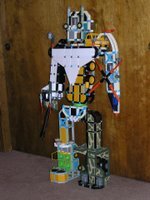 She sports a blue clear mask, and an extra ball socket joint on her chest which many a Bioncile finds attractive. Let ME cut the Turkey for you! 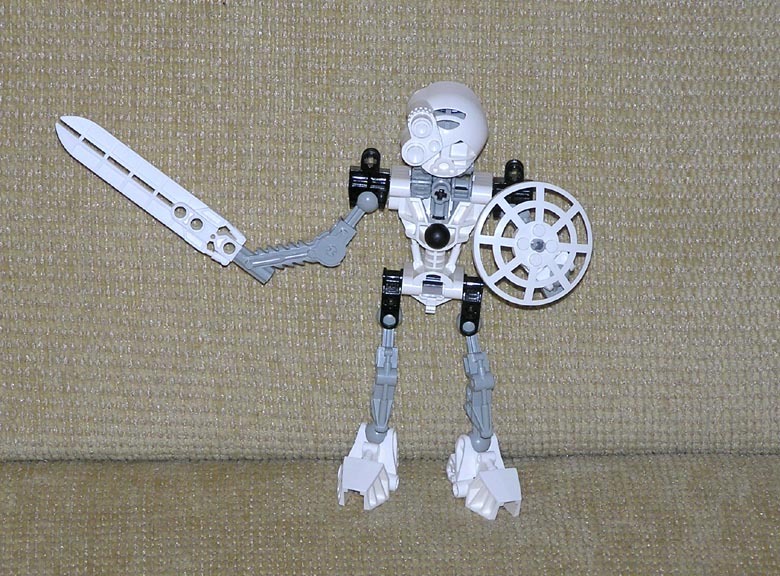 Kopaka was my favorite original Bionicle. You just can't beat the shield and sword combo. He reminds me of some sort of Greek statue. Maybe because I was in an Art History course at the time when I bought him. Have a good Turkey day! I said... DON'T SIT ON ME! 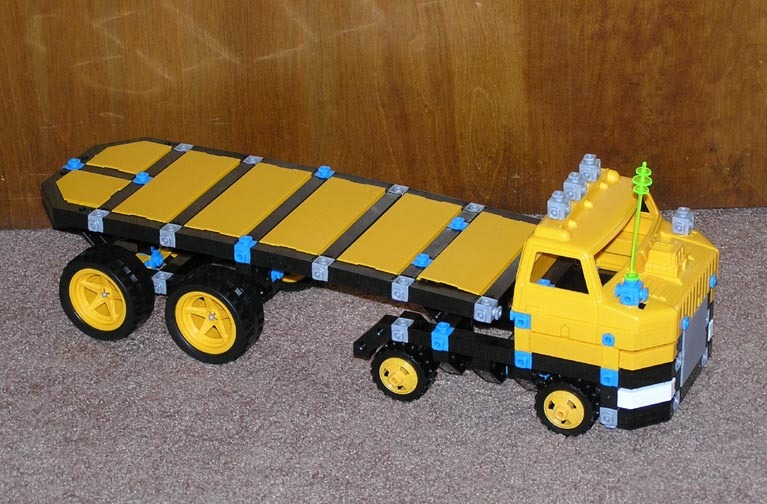 Took me near three hours to get this thing unattached from my behind. When displaying Bionicles, don't place them on the couch and forget. Onua here, is the hunch back Bionicle digger. You could also classify him as the backscratcher or leaf racker Bionicle. Its fun to spin his back gear because both arms go spinning crazy. 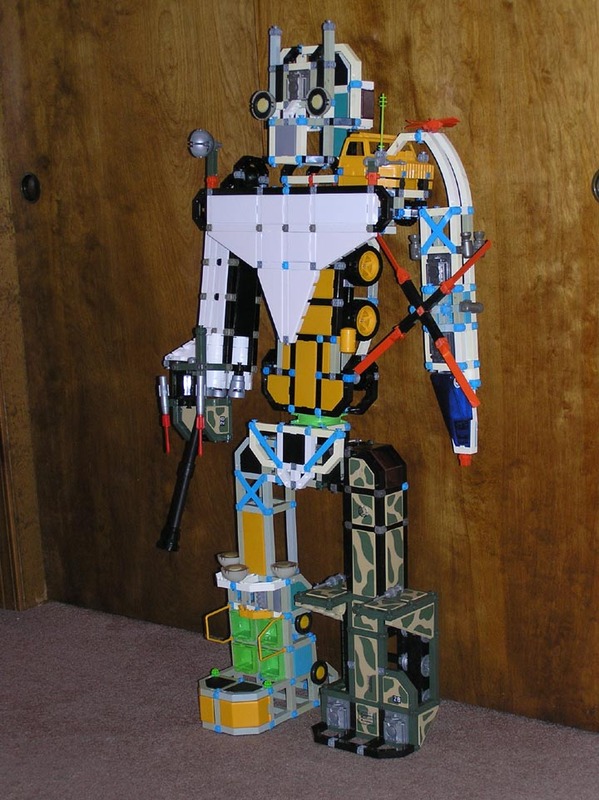 He is good for digging deep into a bin of legos. Look at those claws! Hmmm, they could be bird feet as well. 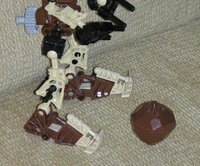 Thats my Lego Rock, and you can't have it! 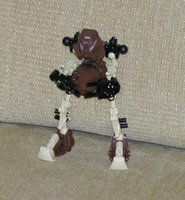 Probably spoken from Pohatu the Brown Bionicle from the first series. One of my favorites, his design is flipped so he can kick a lego rock instead of bat with his arms. 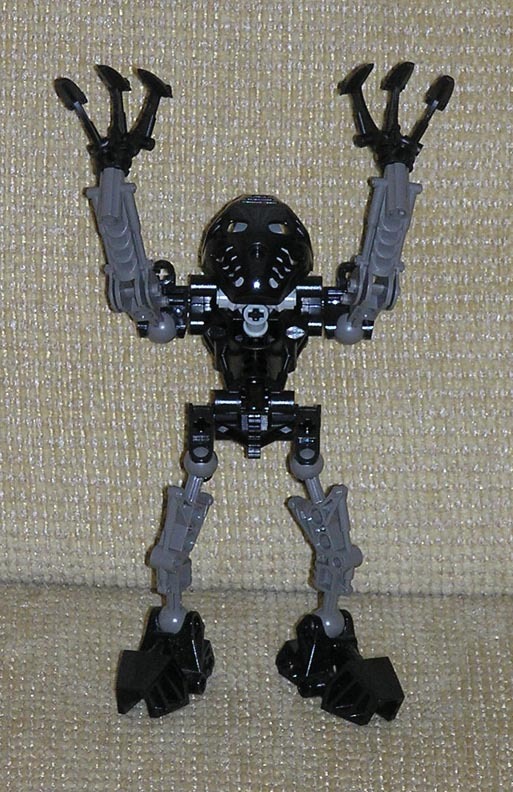 He seems to be always gaurding that rock of his in his Bionicle hands. That, or he is insisting a game is to be played. Extra sturdy shoes gives advantages in kicking. Ouch! My hand is on fire! 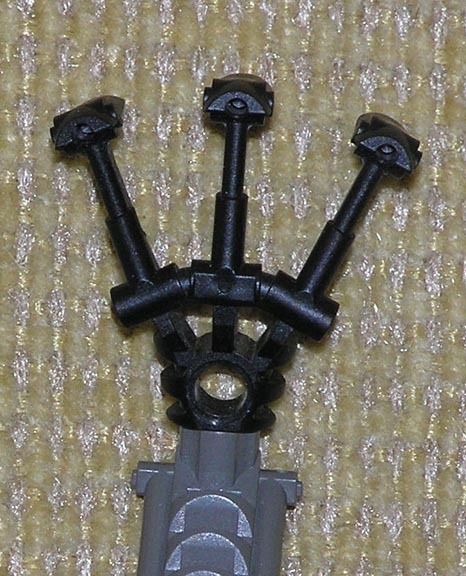 Or so the Bionicle would say. 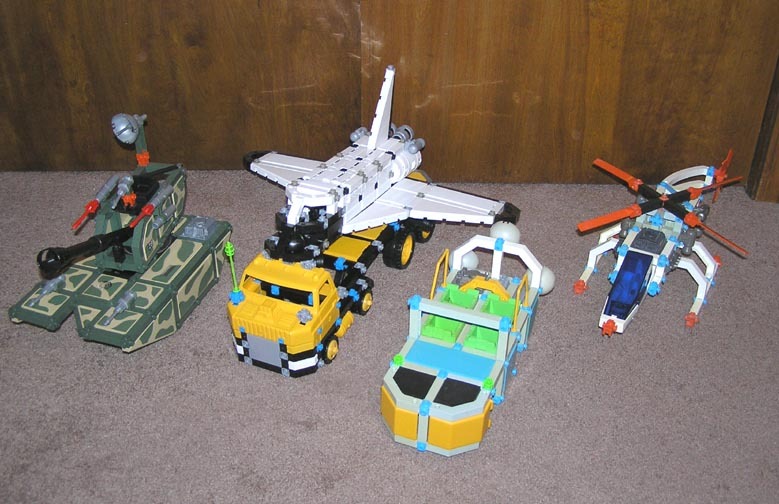 The first run of these toys are my favorite. Not too complicated, look good as a group, and have the best masks. Red guy here, whose name escapes me, has a fire torch weapon that works well for roasting marshmellows. I like the old gear system too, it made them alive in some ways. 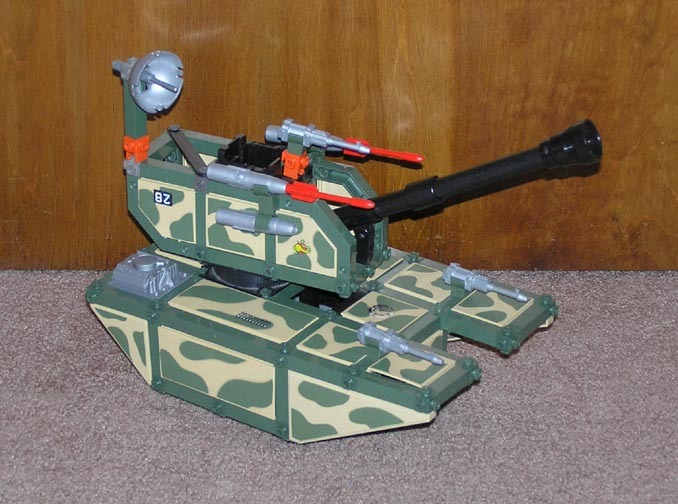 They were quick to rebuild after battles as well. I used to chuck the ball bad guys at them down the stairs and watch them explode. So, it's been about a week... Am I still listing to Casino Royale? Yep! ITs a good one. Just saw the movie tonight, it was spiffy! Nice to see the franchise move in the direction it is going! And a good name for the New Bond as well. Dan's thoughts on Casino Royale Soundtrack! So, AT LAST! Casino Royale is out on the CD shelfs. It was a task to get today, two stores I went to were too lazy to even stock it yet. Best Buy actually pulled through on this one for once. Usually soundtracks are the least of stores worries to get out on time. Thankfully I found a copy and can now calm down a bit. After the huge coolness that was Tomorrow Never Dies and The World is Not Enough I says, 'If David Arnold writes another score half as good as his first two, the CD player is in for a treat. Then came Die Another Day. It wasn't that great,(stupid Madonna). Well the Die Another Day score was good in the film, and lots of neat stuff was omitted on the cd which really weakened it, as well as the over use of the Bond music, which ended up feeling forced, hey another coma. So with that in mind I was worried about Casino Royale. Would Mr. Arnold go back where he started or start moving off into a real bizzar land? The answer is he went somewhere else. Even without using the main Bond theme very much there is still much to listen to. Some great action tracks throughout the score are the strong points. Now, some people can get tired of David Arnolds over lengthy action tracks, I find them exciting. They start and keep gaining speed until you can't hear anymore. (thank you TWINE) Track 8, Miami International is almost 13 minutes of great fun. It must cerainly tell the whole story in itself. I will be listening to that one at great length. 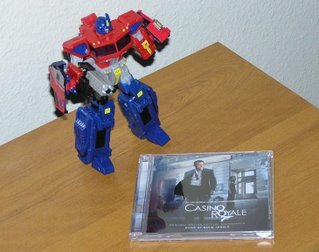 The last track is a spiffy homage to John Barry's classic stuff. A great rendition of the Bond music and really shows off how perfect Arnold is for this franchise. 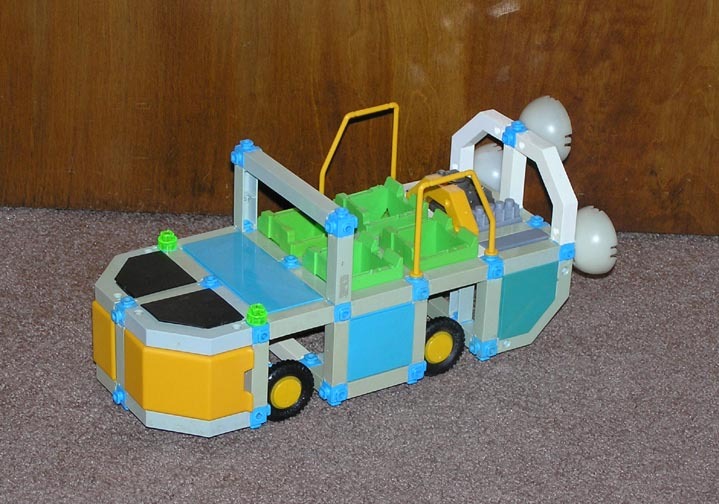 He pulls it off with lots of power and fun. I hope he stays a long long time. As of now I'll give Casino Royal 3 out of 5 stars, if it survives months of listening, Ill bump it up to 4 out of 5, if I listen to it for a full year straight 5 out of 5 (which only a very very very select few scores have done). Oh, I'm so glad Optimus Prime edged out as the New Bond! I like all the Daniel Craig visuals in the previews to trick us too. 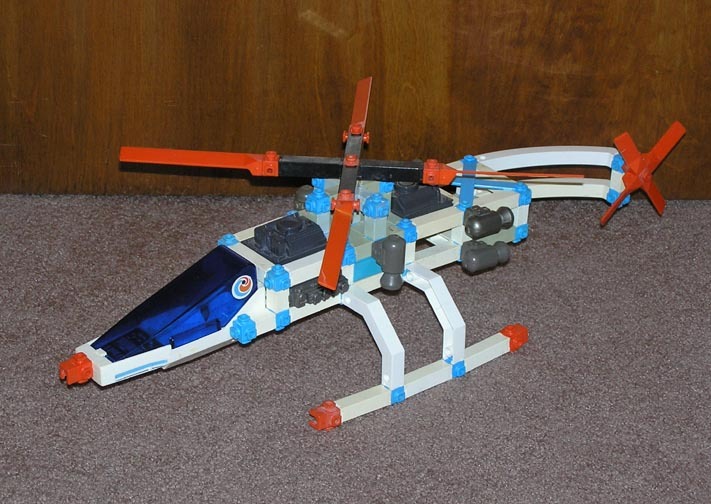 What a cool attack helicopter! Look at all those advanced thrusters! Not to shabby, Future car. I wonder if those little wheels mean it can fly? 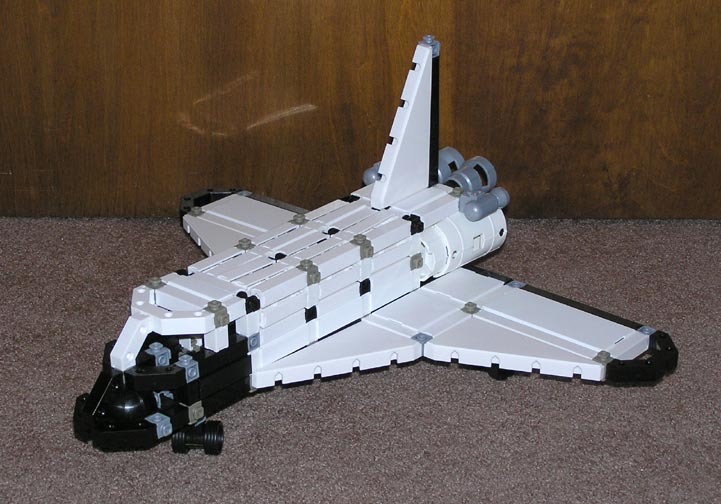 I think we have seen this Shuttle before? Ah, how cute, a group shot. GET OUT OF THE WAAAAAY! Any one who can guess this guy gets my Geek stamp of approval! Bart had to get involved, as always, I left the photo here for scale purposes. 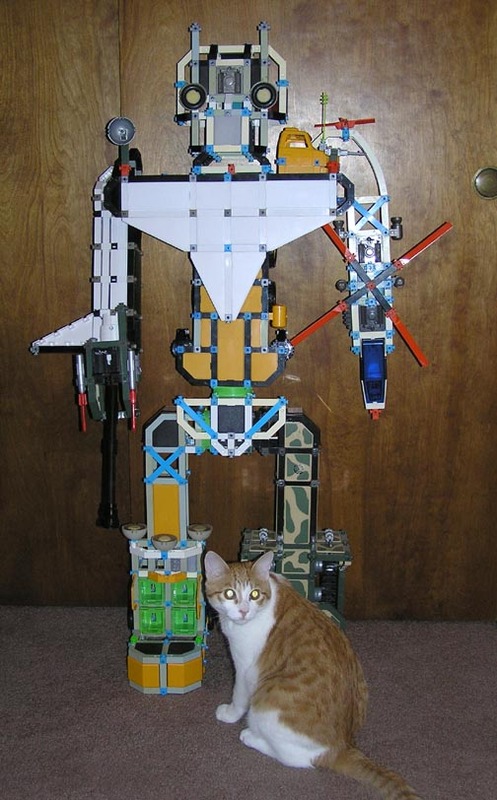 Of course Bart could be the size of that huge cat in the original Star Trek.